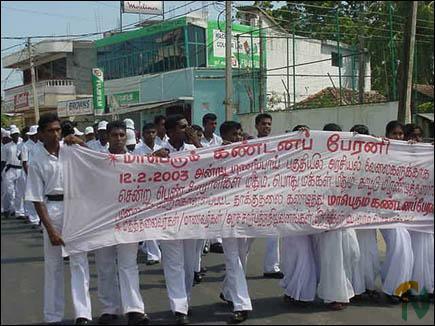 The procession in the Batticaloa town started at the Hindu College at 11 am and ended at the Gandhi Square, where Ms. K. Thankeswary of the Batticaloa women’s upliftment committee handed over to the additional government agent for Batticaloa, Mr. V. Shanmugam, a memorandum to Prime Minister Ranil Wickremasinghe, the LTTE and the SLMM. 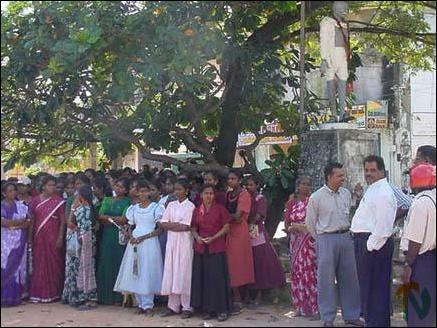 The Batticaloa district came to a standstill on Wednesday, sources said. “We strongly condemn the brutal attack in Manipay on unarmed women political cadres of the LTTE by the Sri Lanka Army and the paramilitary EPDP. 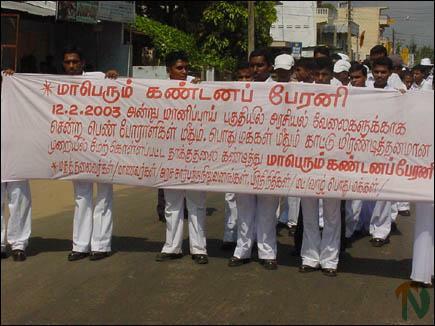 At a time when Tamil National leader V. Pirapaharan and Prime Minister Wickremasinghe are taking forward the peace process with international support, the occupying forces of the Sri Lanka army and the paramilitary collaborators of the EPDP attacked the women political cadres in an uncivilized and brutal way, with knives and sticks, and forcibly pulled out their waist belts. By this act, the Army has shown its cowardice and ethnic hatred. “When the public who saw the incident went to the aid of the cadres, they too were attacked brutally in front of SLMM members. Such actions can never be justified by anyone. These actions by nefarious elements, intended to derail the peace process, are continuing as provocative attacks in Batticaloa, Kanchirankudah, Trincomalee, Delft and Manipay have demonstrated. “The Liberation Tigers, as our sole representatives are taking forward the peace process, we, the Tamil people, are fearful that these acts of deliberate provocations may disrupt the chances for peace. Moreover, whenever any provocative attack happens, the Sri Lankan government gives the assurance that such incidents would not be repeated, but the government remains unable to control the actions by the armed forces. We wish to emphasize that the entire responsibility for such incidents rests with the government.